Kelly the Culinarian: Big Announcement! No. I'm not knocked up. I'm not sure why every time a woman says she has big news or a big announcement, the assumption is she's expecting. 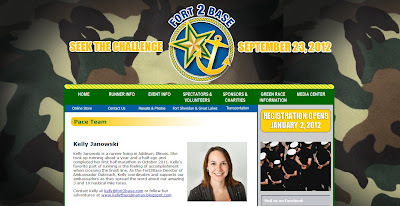 I'm the Director of Ambassador Outreach for the Fort2Base Race! I'm so jazzed about this new position. I'll be formulating the ambassador program, identifying ambassadors, arranging meet ups and building excitement for the race. It's my little baby, which I'll be nurturing until race day on Sept. 23, 2012. If you're interested in becoming an ambassador, e-mail me at kelly@fort2base.com. Another pretty exciting tidbit is I got an e-mail from Maggie telling me I won a fuel belt in her raffle. She's running the Chicago Marathon for the American Cancer Society on behalf of her uncle. It's a really great story and if you're looking for a charity to support this season, this is a great way to give. I now have two trays of salted caramels and saltine toffee to finish, so back to the kitchen I go. Check back for the recipes tomorrow! Thanks for the shout out! :) Good luck with your ambassador role! !